The papaya tree, like the banana tree and coconut tree, is not actually a tree in the botanical sense of the word. It’s more of a giant plant with a soft and hollow trunk that grows rapidly to a height of 8-10 m and survives for about 25 years. The fruit grows directly on the trunk and weighs around 1 kg when fully ripe. However, the weight can go up to 5 kg, depending on the varieties. 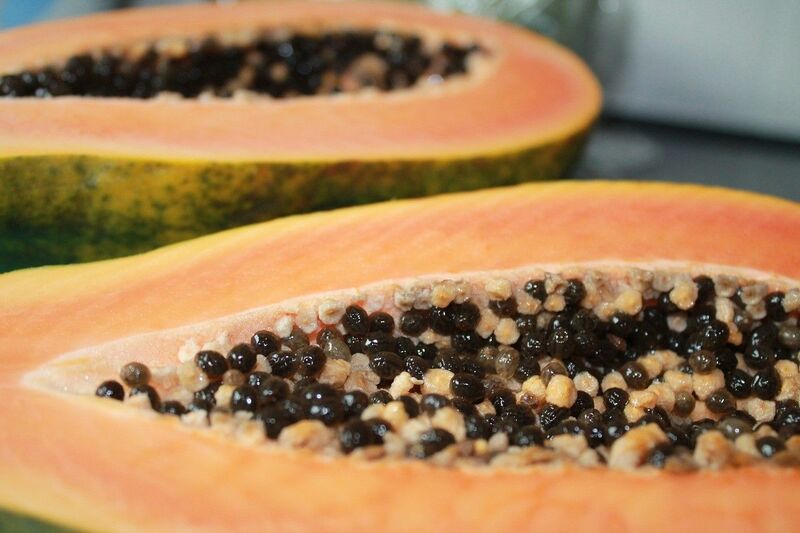 The scientific name of this plant that originated in the eastern part of Central America is Carica papaya, derived from the Caribbean word papayana. This word likely signifies ‘hammering’ as it refers to the ability of the plant’s latex to tenderize meat, in the same way as a hammer-blow! It’s the enzyme papain that is responsible for this effect, and this makes papaya very valuable not only in the food industry but also in medicines and cosmetics. Papaya is rich in antioxidants and fibres. Nowadays, it can be found in grocery stores all year round as it is imported from Central America or Brazil. When buying the fruit, make sure that the skin is either amber in colour (as this signifies ripeness), or at least green with lots of yellowish streaks. There should be no signs of browning and it should feel smooth and yield slightly when pressed. If the fruit is not completely ripe, keep it at room temperature till it ripens, then pop it into the refrigerator, where it will remain fresh for a few days. Originally published in the Journal de Montréal on December 11, 2010.